Well, what do you know? I’ve finally found digital components I can live with! Of course, the MSB Reference DAC and Reference Transport under review here aren’t gonna push my record players and tape deck off the equipment stand, but they will occupy a place of honor right beside them. What’s changed? The thing that matters most: The MSB Reference DAC and Transport make digitized music sound like the real thing. And, thanks to MSB’s optional preamplifier module with multiple I/Os and world-class, constant-impedance, passive analog volume control, the Reference DAC doesn’t need to be hooked up to an $80k outboard preamp to work its magic. The preamp section with passive volume control is just one of many modules this highly configurable DAC can be fitted out with. 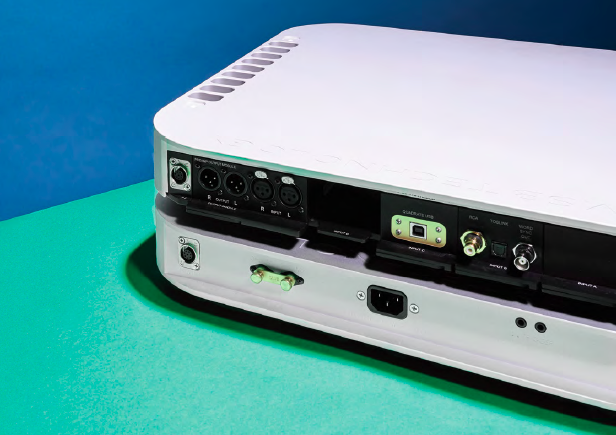 In its stock setup ($39,500), it comes with four “hybrid” DACs (for which, see below), a TosLink and coaxial input module, MSB’s Femto 140 clock (once again, see below), a standard XLR/RCA output module, and a dual power base with separate power supplies for the digital and analog circuits—all housed in two elegant, beautifully machined, rectangular (with milled-into-a-curve corners) aluminum enclosures. On the narrow front panel of the DAC section (which sits atop the power-supply enclosure) you’ll find a centrally located, easy-to-see 590-pixel display that reads out everything from input source to volume level to sample rate. To the right of the display is the volume control knob and to its left are three function buttons. On the rear panel four slots accommodate your choice of modules: Pro I2S, standard XLR, SPDIF (coaxial/TosLink), MSB Pro ISL, MQA USB, and MQA/Roon-ready Network Renderer V2—all of which snap in and out of the slots with the throw of a built-in lever—with extra slots for additional RCA, XLR, and Isolated Sub output modules (also lever-installed). Other options include the choice of different clocks (right up to the top-of-the-line Femto 33) and dual-mono power-supply bases. Depending on your input configuration, the Reference DAC supports virtually all digital formats from 44.1kHz Red Book to 384kHz/32-bit PCM, 1xDSD, 2xDSD, 4xDSD, and 8xDSD, DSD via DoP, and MQA. The DAC with preamp module will drive up to four amplifiers. The MSB Reference Transport is also housed in two elegant, rectangular (with milled-into-a-curve corners), CNC’d aluminum chassis—one for the mechanism and one for the power supply. Like the DAC, the Transport handles just about anything on an audio disc from CD and SACD to multichannel DSD and 24/192 PCM (in AIFF, ALAC, APE, FLAC, or WAV formats), as well as anything on an optical disc from DVD to 4k UHD Blu-ray. USB hard drives and thumb drives are also supported. Both the DAC and Transport come with their own battery-powered remotes, but the transport remote will control both products. The Transport remote has all the standard buttons for playing back physical media. There is also a “Pure Audio” button—a legacy of the Oppo transport mechanism that MSB is using in a greatly souped-up configuration—which I would advise you to press. (Among other things it turns off the Transport’s LED display, which, as is usually the case when you turn off displays, improves the sound.) The DAC remote allows you to turn the unit off and on (there is also a button on the power supply box for this, as there is on the Transport’s supply), switch inputs, and control volume. In sum, these sophisticated MSB components are a snap to use or improve. One way to answer this question is to think about those occasions—and they’re extremely rare—when our stereo system fools us so completely into thinking a recorded sound is not recorded but actual that we act upon the sound we heard. Many years ago, I wrote about an amusing experience I had along these lines—and that’ll I’ll bet some of you have had too. I was watching a movie and using a very fine surround system to reproduce the soundtrack. In the course of the film someone knocked on the closed door of my home-theater room. I got up, walked over, and opened the door, expecting to see my wife outside—only to find that there was no one there. The knock on the door, it turned out, was buried in the mix of the movie soundtrack, but the soundstaging of my theater system was so wide, tall, and deep, and its transient response so lifelike (I was using MBL Radialstrahlers at the time) that that knock was re-located well outside the viewing area—midway up the wooden door of my room. Now that was quite literally fool-you realism. Of course, I don’t think I’ve ever achieved the same level of fidelity with anything that wasn’t almost a pure transient—like a knock or a doorbell or a ringtone. The goosebumps that “Nightingale in Berkeley Square” raised were a different order of “real.” Yeah, Connick and Marsalis (on sax) sounded “there,” but unlike the knock on the door I knew that these musicians weren’t actually in the room with me—I was just surprised and delighted by the degree to which they seemed to be. I would argue that this surprise and delight are always part and parcel of stereophonic realism, because in spite of our magazine’s mantra—that things should sound like the same things do in real life—we don’t really believe we’re going to get the full measure of equivalence on a stereo. We rightfully believe we’re going to get a fair measure of it. Thus when a system exceeds that “fair” measure, we are surprised and pleased by the unexpected completeness of the illusion. I’m not at all sure I can adequately explain why this magic trick happened with the MSB Reference gear—and happened repeatedly. As I just said, it wasn’t as if Connick and Marsalis had developed the body and bloom of an LP on voice and sax. And yet, in spite of this, the MSB gear reproduced both singer and sax with such supernaturally lifelike immediacy, resolution of performance detail, neutrality of tone color, and dynamic range that they sounded “there” enough to astonish me.